Happy Holidays everyone! We are looking forward to a great holiday season at Jaynes. As you may know we take the first 2 weeks of January off as a staff holiday. Many miles are traveled and many great meals are consumed around the globe. Its our annual mojo hunt and we come backed refreshed and very inspired for another great year. Of course we make sure to go out with a bang in December. Some highlights include a New Year's Eve feast and a Christmas Eve Event that will be announced shortly. Of course if you are looking for a great gift for friends and family we have gift cards available. You can purchase them in person or over the phone. For year December and Jaynes has become the month synonymous with a little beer you may have heard from the Emerald Isle, Guinness! 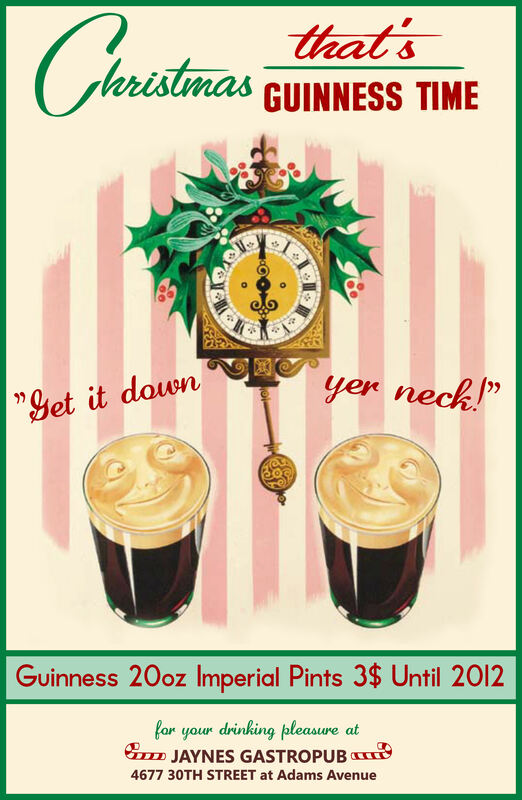 Each year starting December 1st until 2012 we pour 20oz imperial pints of Guinness draft for just $3, all the time. That's right, all the time. This is just a small gesture of thanks to all of our guests for another wonderful year at Jaynes. Please come celebrate with us this year!